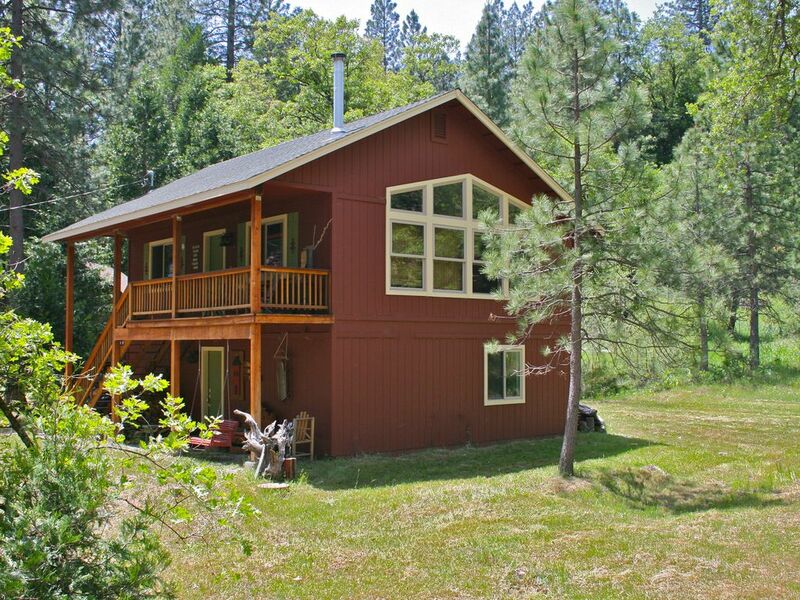 Your cabin sits in a peaceful forest just a short walk from a picturesque mountain stream. As you enter you will find your cabin spacious and clean. The great room is a living area with a wood stove for the winter and an open kitchen and dinning area. The windows are large letting in plenty of light and with views of the forest. There are two cozy bedrooms that are very inviting, both with views of the woods. The bathroom is delightful and has one sink with granite countertops. There is a redwood balcony porch where you can relax watch birds, squirrels and other wildlife and hear the creek flowing. Yosemite south entrance is just a 45min beautiful drive and Bass Lake is only 15 min. Drink your morning coffee, gaze into the woods, watch wildlife and listen to the creek from your inviting porch. This cabin sits in an amazing location. Hike to spectacular water falls, go fishing in the stream, go on an epic mountain bike ride! There are no crowds ever! Really enjoyed this place! I recommend it 100 %. We hope to go back soon! The cabin was fantastic. A truly relaxing place. Everything that you need for cooking and relaxing. Well maintained with love and care and it shows. Perfect for a small family. Hard to find the first time, so definitely don’t arrive after dark. Doug is totally on top of things as far as questions you have about anything. Overall a winner in our book and we would love to return soon. The cabin is located in a nice and quiet area. We appreciated that it provided cooking utensils and dishes for home cooking. It was also nicely furnished and very welcoming. Thank you for all the prompt responses and we loved our relaxing stay at the Tall Red Cabin! Flirts impression, super cute & clean! All the details gave it a feel of cozy. The cabin had everything needed to prepare a meal and eat comfortably. The creek/waterfall was very close as well, very serene! I would say the cabin was very nice and it would have been perfection if the grasses/weeds were cut, maintained. Otherwise beautiful. Beautiful cabin in the middle of God's creation... Close to all 3 National Parks in the Area. Would highly recommend.